The Hot Springs Area Cultural Alliance (HSACA) and Presenting Sponsor Arvest Bank is pleased to announce the return of Arts & The Park. A ten-day celebration of the arts, scheduled for April 26th – May 5th, 2019 in Downtown Hot Springs National Park, Arkansas. HSACA is excited about showcasing the thriving talent of local and statewide visual artists, musicians, dancers, poets, jewelers, potters, performers, authors, glass makers, sculptors and more in the events that will be held during Arts & The Park 2019. 2019’s Arts & The Park will kickoff the ten-day celebration with a launch party on Friday, April 26th, followed by Art Springs, a free two-day outdoor juried art festival and showcase bursting with fine artists and artisans. The much-anticipated Chalk Walk Competition will take place this weekend. More details to come. Art Springs is held at Hill Wheatley Plaza in historic downtown Hot Springs on Saturday, April 27th and Sunday, April 28th. Studio Tours will be a highlight of this year’s festival being held Saturday, May 4th and Sunday, May 5th, where curious art lovers can go visit the personal studios of participating artists. This is a hands-on, eye-opening experience for visitors to interact one-on-one with artists and see them in their creative environments. 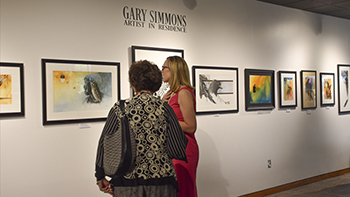 There will be numerous arts events throughout the 10 days, including Gallery Walk on Friday, May 3rd, artist demonstrations at downtown galleries, artist workshops for all ages, poetry readings, concerts and more. “Attending an arts festival in America’s first National Park is an experience that is unrivaled, and it really showcases the beauty of our city, teeming with the artistic inspiration and talent of our citizens,” said Ashley Campbell, HSACA Board President. Arts & The Park 2018 was great, but 2019 is going to be our best year yet, and we look forward to the collaboration and creativity to come, as we celebrate, advocate, and promote the arts in Hot Springs.